Cunningham, Ada Belle Obituary Miss Ada Belle Cunningham died at her home on north Cherry Street, 22 March 1902, age 21 years 1 month 8 days. The memorial service was Sunday afternoon at 4 pm. Surviving are her mother, who is widowed, and her younger sister. Johnson County Births, Deaths and Marriages, Thurs 27 Mar 1902 #13. A large concourse of people paid tribute of respect at the memorial service Sunday afternoon at four o'clock. 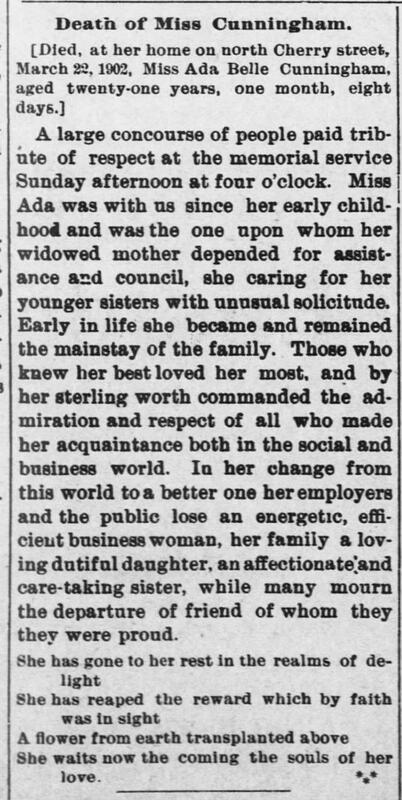 Miss Ada was with us since her early childhood and was the one upon whom her widowed mother depended for assistance and council, she caring for her younger sisters with unusual solicitude. Early in life she became and remained the mainstay of the family. Those who knew her best loved her most, and by her sterling worth commanded the admiration and respect of all who made her acquaintance both in the social and business world. In her change from this world to a better one her employers and the public lose an energetic, efficient businesswoman, her family a loving dutiful daughter, an aff ctionate and care-taking sister, while many mourn the departure of friend of whom they they were proud. She waits now the coming the souls of her love. 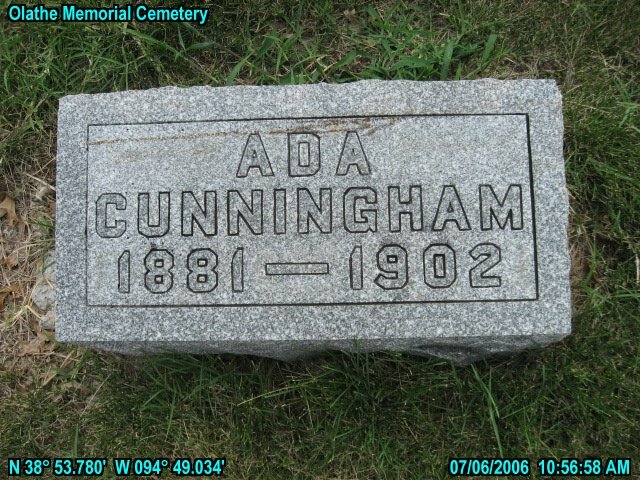 Miss Ada Belle Cunningham died at her home on north Cherry Street, 22 March 1902, age 21 years 1 month 8 days. The memorial service was Sunday afternoon at 4 pm. Surviving are her mother, who is widowed, and her younger sister. Johnson County Births, Deaths and Marriages, Thurs 27 Mar 1902 #13. Please share your memories of Ada Belle.